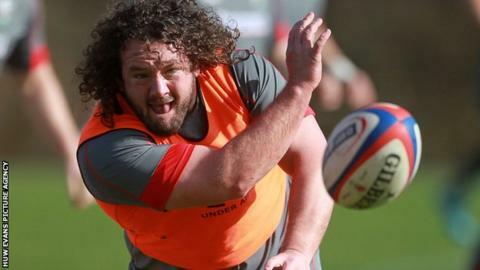 Wales prop Adam Jones says he is "gutted" after missing out on selection for the autumn internationals. Coach Warren Gatland omitted the 95-times capped tight-head from his 34-man squad to play Australia, Fiji, New Zealand and South Africa. Gatland said the coaches had asked Jones to work on aspects of his game. Jones, 33, tweeted: "Thank you for the overwhelming support. I did everything I was asked and more. Obviously gutted, but will keep trucking along." Gatland added that the "door was not closed" on Jones returning to the squad. "It's important that he continues to keep working on his game, and we've had that conversation with him," he said. "What's become paramount in the game is the ability of front rows to become more mobile and to get around the park and we've had that conversation with Adam. "He's working on it and continuing to work on it and we're still looking for more involvement from him around the pitch, potentially a greater anticipation." Blues director of rugby Mark Hammett says the player is in "the best shape of his life" and felt he would be ready should Gatland recall him. "While he may miss out on this early series, if he continues on the track he's on... if the call does come up he's going to be in a great position and I think 'Gats' is going to be really stoked with what he's got," Hammett said. Jones joined the Blues from Ospreys in the summer after 11 seasons with the Swansea-based region. It followed a difficult summer which saw the 2009 and 2013 British and Irish Lions player having to train on his own while negotiations over a new deal at Ospreys stalled. Jones was substituted after 30 minutes of Wales' 38-16 defeat by South Africa in the first Test last June, and was not included in the match-day squad of 23 for the second Test, which saw Wales give a much improved display before losing 31-30. His place went to Scarlets tight-head Samson Lee, who is again named in the squad for the autumn Tests.